The protest came as the party continued to mount pressure on the GECOM to respond to its call for reform in the electoral process. 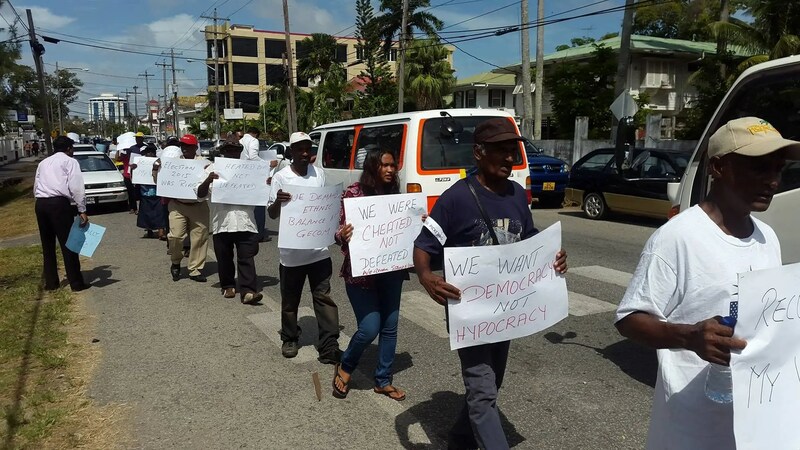 Still maintaining that they were “cheated not defeated” at the May 11 national elections, dozens of members and supporters of the opposition People’s Progressive Party on Tuesday staged a midday protest outside the Guyana Elections Commission (GECOM). However, the majority of PPP Parliamentarians and high-ranking members from its Central Executive Committee were absent from the picket line. Updating the media on the Party’s objective, PPP’s General Secretary Clement Rohee said the move was intended to exert pressure on GECOM. He said there is need for urgent changes to be effected at the Commission, particularly since preparations are underway for the holding of local government elections early next year. Local government elections have not been held in Guyana since 1994 and there have been several legislative updates to the process. Mr. Rohee believes GECOM is ignoring his party’s call for “necessary” reforms that should have been done before the May 2015 regional and general elections. The PPP has accused GECOM of colluding with the coalition to “rig” those elections. The elections were declared as free, fair and credible by the international community and the observer groups. Rohee said the new round of protests will be an ongoing exercise until the PPP achieves its objectives. “Whether it will be long-term or short-term will depend on how the situation develops.” The PPP is still calling for resignation of GECOM Chairman, Dr. Steve Surujbally. The General Secretary further explained that the demand for Dr. Surujbally’s resignation does not mean that the party will not contest the local government elections on March 18, 2016. “It is not about personality but about a process that is flawed and undemocratic,” he added. On Monday, Executive Secretary of the PPP, Zulficar Mustapha said he is convinced that the Elections Commission is not prepared for the holding of local government elections.